Tony Amonte is amazing. Not only does he currently lead the NHL with 22 goals, he works hard, plays defense, takes the body, and skates really, really fast. Although, to be fair, our buddy ALF is speedy quick in his own right. Just look over there. 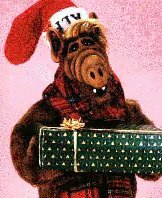 In the time it took you to read this, ALF wrapped you a present. Thanks, ALF! How are you going to spend Christmas? Curled up alone in the corner of a dark room drinking straight Scotch until you pass out. Raymond Bourque reached another milestone in his brilliant career, surpassing Gordie Howe on the all-time assists chart. Bourque discusses this and other topics with people we don't know. After a season and a half in the appropriately black-and-blue jerseys of the Tampa Bay Lightning, Mikael Renberg has come home to Philadelphia. But can he make the Flyers a legitimate Stanley Cup contender again? Wayne Gretzky has a lot of fond memories involving Maple Leaf Gardens. Too bad the grand old arena is about to become the next victim of corporate greed. As per usual, here are some things that weren't made into full features. Topics discussed include: New Jersey's balanced scoring, Calgary's surprising road trip, Alexei Kovalev playing great, the joys of having a crooked thumb, and more. The All-Star voting is in full swing and it seems as though fans in Detroit need a hobby. News and notes from around the American Hockey League. It's a holiday miracle! The Behind the Bench section has been updated! It's the holiday season, so that means we once again bust out the ol' Christmas features. Sure, you've probably read 'em before, but would it kill ya to read 'em again? C'mon, really? It's for charity! Issue 111, the seventh issue of the 1998-99 Season will be published on Wednesday, January 13. Please note that issues will now be offically released on Wednesday, not Tuesday.